San Juan is a very lively place on a Saturday night! 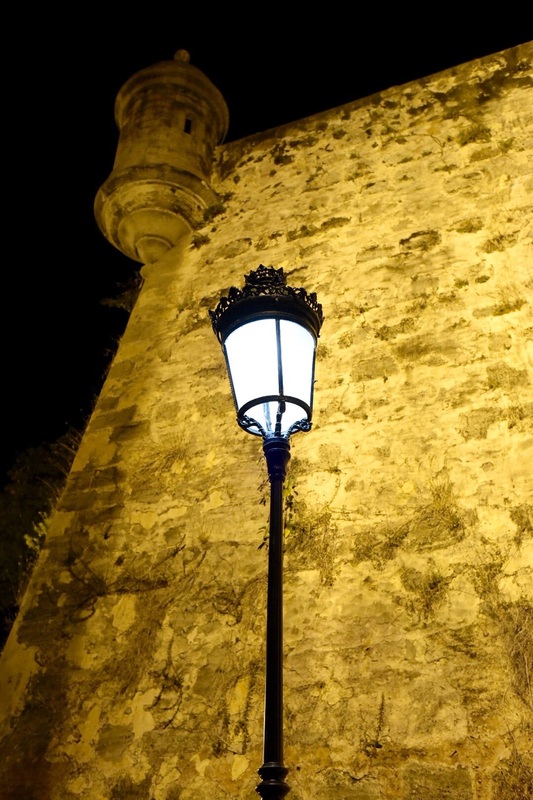 Old San Juan is surrounded by the colonial city walls, many of which are dramatically lit at night. There is a wonderful walkway along the ocean call Paseo de Princessa. 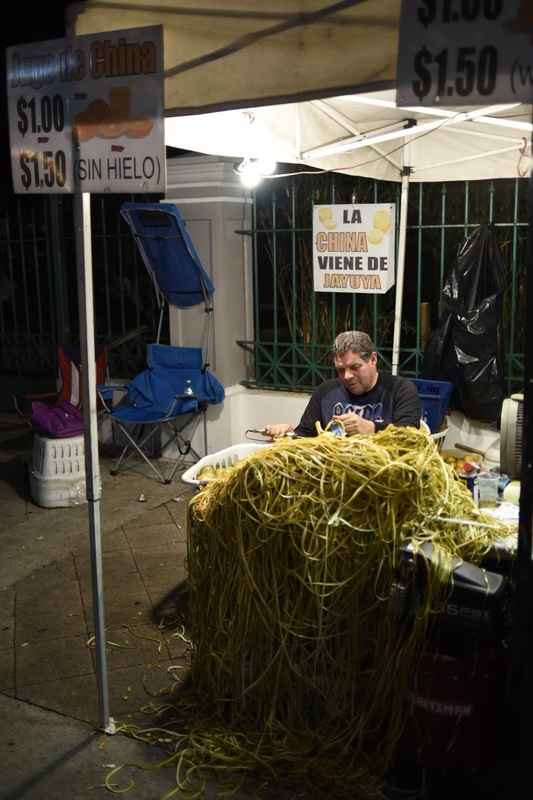 It follows along the outside of the walls and the part closest to the center serves a street fair of sorts with artisans invited by the Puerto Rico Tourism Company to sell their handiwork. There are food trucks and vendors also lining the pedestrian walkway. What we love best about it is that the promenade is full of families out enjoying the Saturday evening! An artisan works on caritcutures of children. 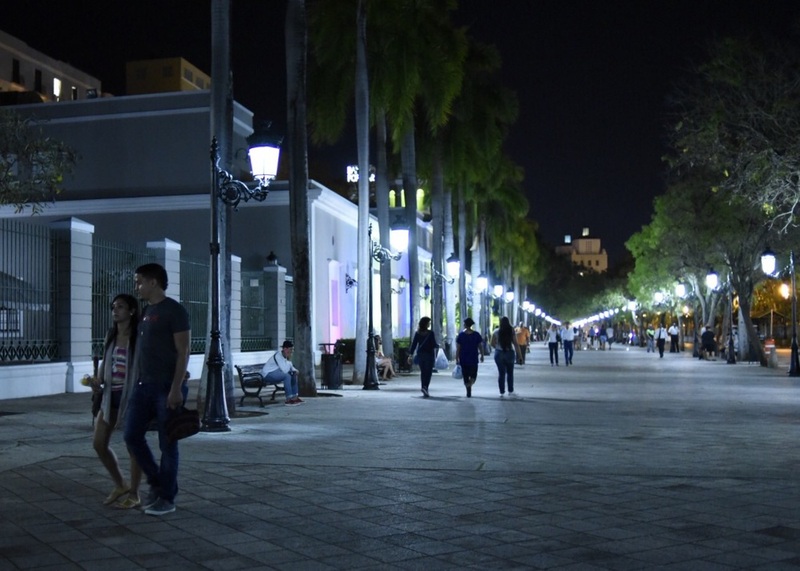 Brightly lit, patrolled by friendly security officers, the Paseo De Princessa is a safe, fun place to people watch locals and visitors in historic Old San Juan. Working with a electric peeler, an orange juice vendor creates a huge pile of orange peels by nights end. The cost of this hand squeezed treat on the street? $1.50 for a larger than 8 oz cup. Old walls, and old colonial buildings are meshed with new parks and sculpture to create a wonderful place to sit or stroll. Raices Fountain is a more recent addition to the area, a dramatic installation with a descriptive plaque in English and Spanish which explains all of the elements of the sculpture and what they relate to Puerto Rico. 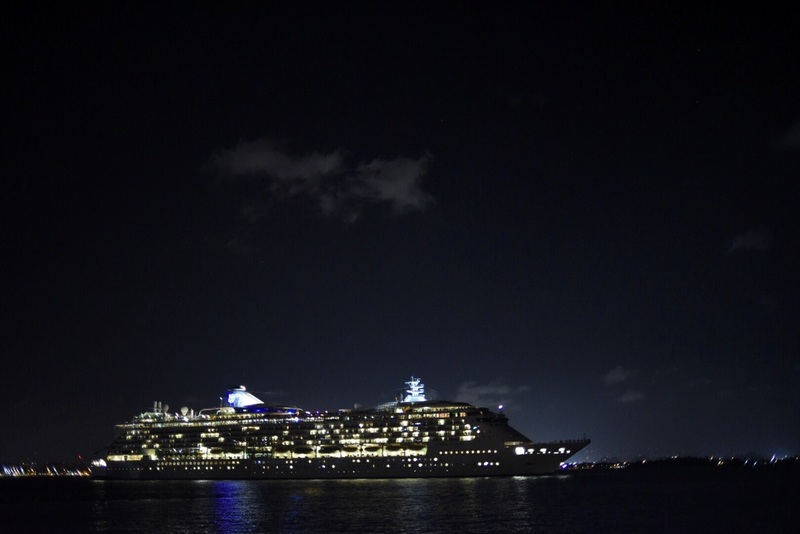 Because it was Saturday night, we had the opportunity to see Jewel of the Seas sail out of port at 8:30 PM, knowing that Sunday night, we would be aboard Adventure of the Seas and sail past the same spot! And on Sunday night, we sailed out of San Juan past El Morro and its imposing walls and moody light house!